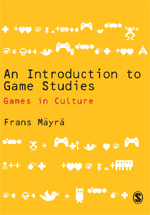 This is a companion website to the textbook An Introduction to Game Studies: Games in Culture by Frans Mäyrä, published by SAGE Publications Ltd.
You can use this site to access the table of contents, as well as to find links to some bookshops that have the textbook available for ordering. In the right sidebar, you can also browse various content categories, including journals, organisations, as well as selected online publications that relate to game studies in different ways. Most of these are mentioned and discussed in more detail in An Introduction to Game Studies, but this online companion will have a life of its own, potentially also inviting discussions through its commenting tool. Note that page preview and word search are now available through Amazon.com services. Visit again to see new content being added to this site! are you a teacher? It is possible to get instructor review and desk copies of the textbook from SAGE Publications: see more information here (for the US) and here for Europe. It is also possible to leave feedback through this site — and suggestions for its additions or improvements. Good work, Frans. I’m very much looking forward to the book!! I think the book can now be ordered through several bookshops, even if the official release date is March 19th. I have now updated this site to contain some basic information resources. Added the ‘tag cloud’ today to facilitate thematic browsing. Looks very interesting, I’m going to order it! I think it’s amazing that such pioneering work is done right here in Finland. I never knew something like this was being done in my home university. Keep it up. Adlibris seems to be the cheapest though.